Independent Arts has more than 30 years' experience of providing creative activities to older people and community groups. Through our Workshops for Wellbeing programme, we offer a range of activities, which can be delivered to a variety of clients in both residential homes and community settings. We work hard to provide trained, skilled and talented practitioners for our clients. All our practitioners are DBS checked and covered by Independent Arts' insurance. We are constantly developing the selection of activities we can provide. Find out more through the links below. "We really appreciate the time and effort given in submitting both ‘Swimmer’ and ‘Portrait of my Wife’ and we would appreciate if you could pass on our gratitude to both residents. We had over 90 entries this year and we were amazed at the calibre of art we received. ‘Portrait of my Wife’ was shortlisted as one of our final 15 and both the team and the judges were so impressed with Resident D’s work that we created a highly commendable prize and their work may be used for other Round 4 publications like upcoming local reports. Congratulations to Resident D! They have won a £15 gift card." This textile print was produced in a screen printing workshop run by Independent Arts artist practitioner Leigh Jackman at Fairhaven residential care home (Ryde) during the summer 2018. 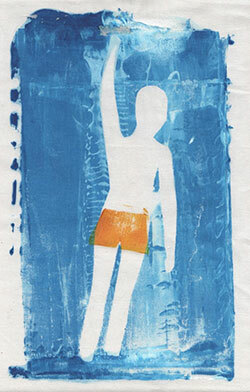 The print was completed in two print workshops. Residents were shown reproductions of David Hockney’s Pool with Two Figures (1972). They looked at the way in which the artist stylised the representation of the light on the water and the swimmer’s form. Using a screen printing process residents first printed the swimming pool and swimmer, followed by the bathing suit in the second follow-up workshop. 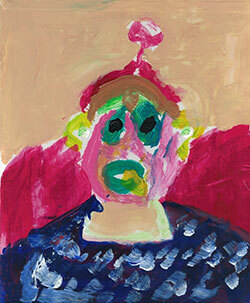 The resident that produced this painting is living with advanced dementia and has very high needs. When he first joined the workshops he was frequently quite agitated and distressed. Nonetheless he continued to attend and over time both the artist practitioner and staff at the home began to notice changes in his behaviour. He became noticeably calmer, quieter and happier when engaging with creative processes. R now really enjoys taking part in workshops, and he is able to concentrate for longer periods. Art has had a significant impact on this resident, enabling him to live well, and to express himself creatively. This painting was produced in a painting workshop run by Independent Arts artist practitioner Leigh Jackman at Springfield Nursing Home (Shanklin) during the autumn 2018. The artist began the workshop by showing residents examples of portraits by well-known artists and then encouraging residents to use paint to create their own self-portraits. Quite by chance the painting workshop coincided with a visit to the home by the resident’s wife, and both the resident and his wife were invited to participate. Both chose to join in and for the duration of the workshop sat silently facing one another, working on portraits of each other. The portrait we have chosen is by the resident of his wife. A Soundbeam session enables people with even the most limited movement to create sound and music. 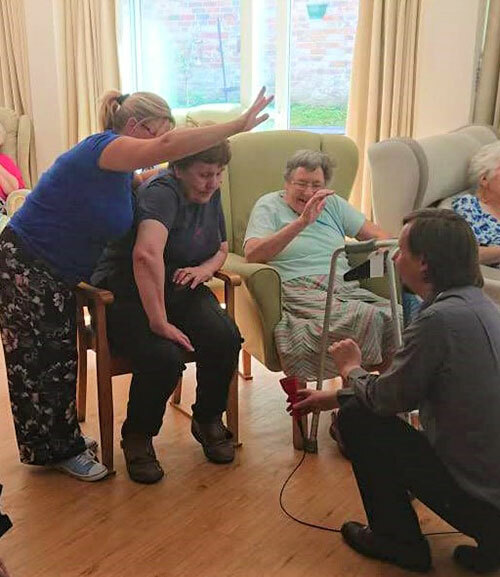 "I think my best Practitioner experience was seeing an elderly gentleman who had severe dementia and only felt safe with a blanket over his head, gradually emerge from hiding and start singing with me." Our practitioners deliver over 2000 activities sessions per year (40+ per week) to residential homes and other centres on the Isle of Wight. 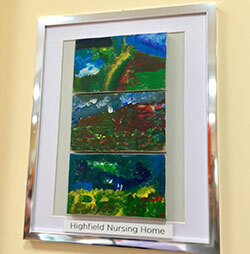 An exhibition of paintings created by residents at Hartford Care (Highfield Nursing Home in Ryde and Springfield Nursing Home in Shanklin) is on display at Highfield (March 2019). 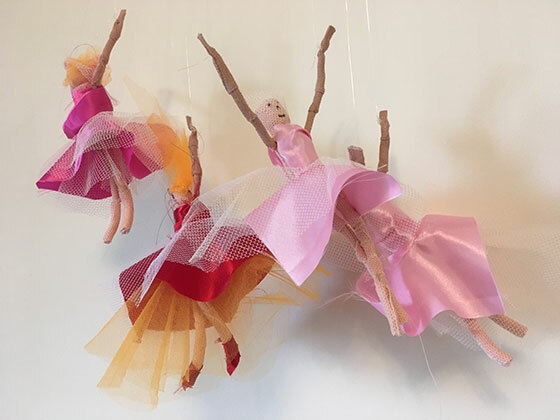 Titled "Impressions – Studies on colour and light" it brings together work from Independent Arts workshops in both nursing homes, taking inspiration from the work of famous artists such as Matisse.